"ligaments given the anti-inflammatory had a 32-percent lower load to failure than the untreated injured (control) ligaments"
Studies indicate that the use of anti-inflamatory medication actually weakens the soft tisssue ligaments and tendons and creates a long term weakness and vulnerability to future injury. The inflamation response is a necessary component of the healing of injured joints. "continuous low-level heat-wrap therapy may be better than painkillers for acute back pain"
It seems to have become standard procedure for nonsteroidal anti-inflammatory drugs (NSAIDs) to be used for acute injuries. Their main action is to inhibit prostaglandins, pro-inflammatory mediators responsible for the production of painful stimuli. There is no question that they often reduce pain and swelling, and therefore help a patient perform motion earlier during recovery, but what is the effect on the soft tissue? Elder, et al.,1 asked the question and performed experiments on the medial ligaments (right knee) of 50 rats through surgical transection. Half of the ligaments were given Celecoxib, a COX-2 inhibitor similar to Celebrex, for the first six days of recovery, while the other half were not. (The injured animals were sacrificed 14 days after the operation.) The ligaments given the anti-inflammatory had a 32-percent lower load to failure than the untreated injured (control) ligaments. Elder, et al., state that to their knowledge, there were no previous reported studies regarding the effect of COX-2 inhibitors on any soft tissue disorders. This article tells us that these drugs, which have been widely advertised, were never tested for their effects on soft tissue. I suppose that patients with osteoarthritis or rheumatoid arthritis have been relieved of pain, but they are in a precarious situation if they experience an injury to their soft tissue. Whatever happened to the acceptance of nature and its innate healing ability? There's an old adage: "Hurry to give a new drug while it's still working." I always thought that inflammation was the body's first line of defense against acute injury. Why inhibit a normal bodily reaction? It makes no sense to immediately give an anti-inflammatory drug to a recent injury. 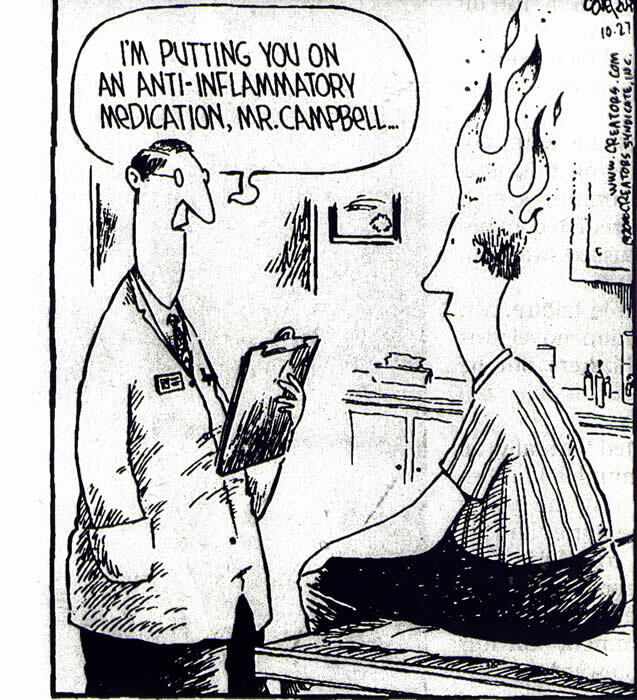 An inflammatory response is beneficial by removing cellular debris from sites of injury to allow quicker healing.2 This type of intervention is similar to the old theory of prescribing aspirin as soon as a slight fever arises. Recently, Mariano Rivera, the great Yankees relief pitcher, was diagnosed with a shoulder strain. The strain was confirmed by MRI, and he received an injection of cortisone. Several weeks later, he was pitching again, and re-aggravated the shoulder. He was sent back to rehabilitation, with the hope that he would be available to pitch in the postseason. It seems logical that any inflammatory ability of his body to create healing was immediately repressed, and his "strain" was not given a chance to completely heal. Elder CL, Dahners LE, Weinhold PS. A cyclooxygenase-2 inhibitor impairs ligament healing in the rat. Amer J Sports Med 2001;29(6):801-805. Almekinders LC. Anti-inflammatory treatment of muscular injuries in sports. Sports Med 1993;15:139-145. Singh G. Recent considerations in nonsteroidal anti-inflammatory drug gastropathy. Am J Med 1998;105(1B):31S-38S. Stanley KL, Weaver JE. Pharmacologic management of pain and inflammation in athletes. Clin Sports Med 1998;17 (2): 1998:375-392. The two most popular nonprescription medications in the U.S. - ibuprofen (i.e., Advil) and acetaminophen (i.e., Tylenol) - have been promoted as "first-line" management of acute low back pain. These analgesics may cause potential kidney, stomach, and liver problems, however. Self-administered topical heat wraps may offer a drug-free alternative treatment for acute back pain. Based on these findings, continuous low-level heat-wrap therapy may be better than painkillers for acute back pain. Simply wrap a Velcro belt with a heating element around your torso. Nadler SF, Steiner DJ, Erasala GN, et al. Continuous low-level heat wrap therapy provides more efficacy than ibuprofen and acetaminophen for acute low back pain. Spine 2002:27(10), pp. 1012-1017.